Earl Scruggs souvenir piggy bank? I just came across an Earl Scruggs souvenir piggy bank. I believe (but am not sure) that they were available at Scruggs shows (or at least a “Scruggs and Friends” show in 2005 (a ticket stub, a signed banjo head and a Earl Scruggs signature baseball cap came with the piggy bank). And here is the bottom of the piggy bank, as well as the 2005 ticket stub that came with the bank. However, the ticket stub is from 2005, and the bottom of the piggy bank is signed "76" (which I assume means 1976). I'm going to sell both my Gibson banjos for one of those RARE Earl Scruggs piggy banks! NOW we finally know where Jim Mills stores his ancient cache of prewar cash! The secret is OUT! We can now rid ourselves of the Verifyer for good. This photographed existence of the Earl Scruggs Souvenir Piggy Bank, renders all Verifyers null and void. I think I'll store my National "oval 8" picks in it... and maybe some buffalo nickels. I'll trade you the piggy bank for only one of your Gibsons . :) . (unless they are both 70s Gibsons... in that case, you'll have to throw in a third) . I had never seen the piggy bank or the hat before, so I bid on them. Have you heard of an ES piggy bank and the history behind them? Congratulations! That was a nice set. No, like you, that was the first I had ever seen, so I'm just as curious as you. Maybe someone else with knowledge on this subject will chime in. Cool hat too. Never saw one like that as well. Great collection at a great price. Good job! The bidding price was very low until the last hour or so (I think I was the first bidder). 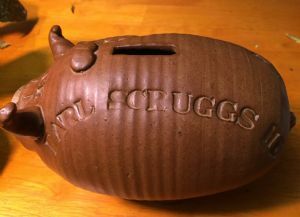 I wonder if the clay piggy bank (that was hand-signed by the artist on the bottom) was a short run or limited edition item sold at Scruggs shows. 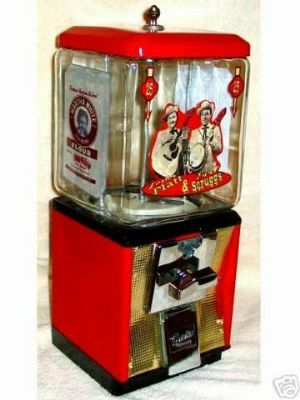 Maybe someone who has attended some Scruggs shows, and had a look at the souvenir tables, can share their recollection. by the way, I just looked up the address on the ticket, and it is the Door Community Auditorium in Fish Creek, Wisconsin. From the photos I saw online, looks like a big place. What leads you to believe that the Scruggs family sold these at shows? Looks like a collection of Earl Scruggs stuff from a fan, who might have made the pig in his honor. The heads were sold at shows in the 2000's. I got one of those in Cherokee. I remember they bought a lot of perhaps Remo seconds and he sold a lot of those. The tickets are from 2005 so that is consistent. (This was the tour where, three months later, he walked off the side of the stage in Myrtle Beach and fell the hard ground (that was terrifying). I do not remember them selling items at the MB show. That, plus the fact that the pig is dated almost 30 years before makes me think it was not an item they sold, but a piece of folk art someone created. But, seriously, I'm guessing it was a short run of piggy banks that someone offered to Earl (or Louise Scruggs) to seel at some shows. I've been keeping a close eye on Earl Scruggs collectables, and have never seen it before. It's great to hear your memories of that time period of shows. You might be right that it was a one-of-a-kind folk art item. 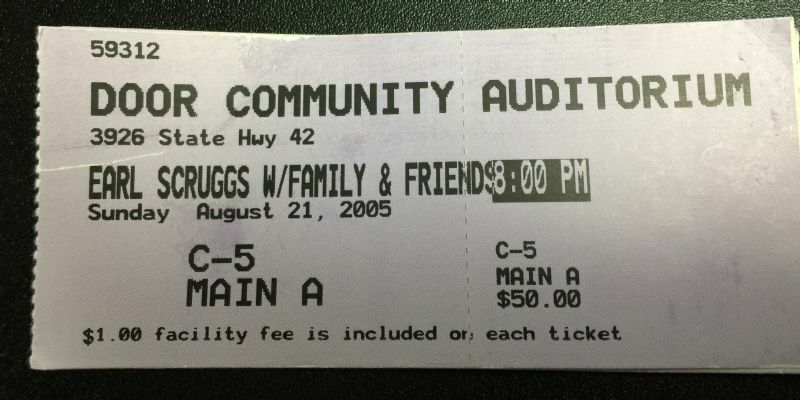 The reason why I think that it is very possible that the piggy bank was sold at a show is that all of the 3 items (2 of which we know were sold at shows) came with the 2005 ticket. That clay pig does not look easy to make. It seems like it would take a pretty good potter to form the round clay body of the pig (without any visible seams) and assemble the other sections of the pig. 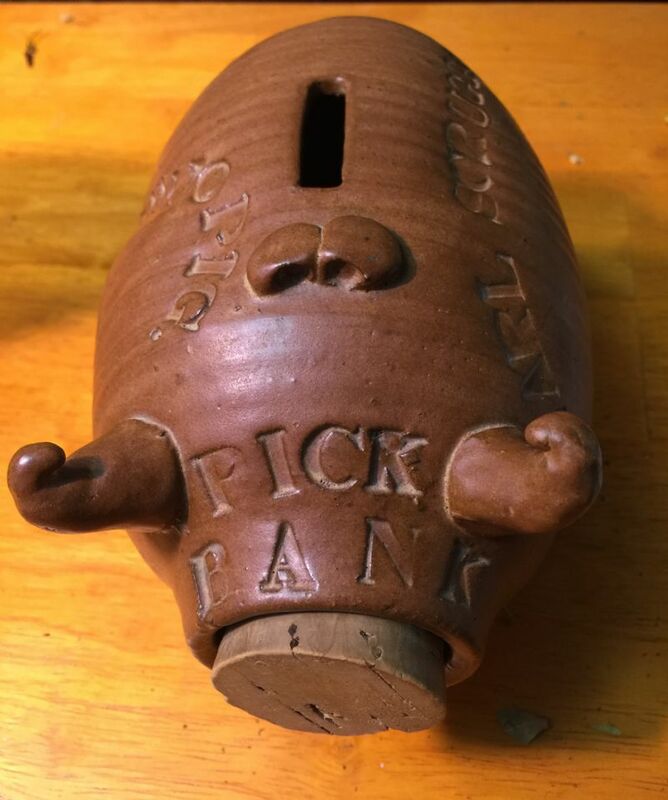 And if the piggy bank is folk art, the artist did a really high quality job in stamping the letters in the clay with pre-made letter type stamps. I wonder if anyone might have an idea who "Tipton" was... Was there a Tipton associated with Earl? p.s... 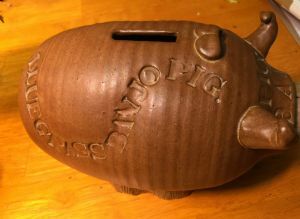 I just emailed the seller to see if they have any info on the origin of the piggy bank. ...That clay pig does not look easy to make. No expert here but the body looks hand slung on a wheel. That's why the perfect concentric rings around the body, which could have been wheeled out if wanted, but obviously left for effect. The base, ears, ribbon, and tail (if it has one) would have been stuck on after shaping the body, while the clay was still green and before firing. Same with the lettering -- while green and before firing. Notice he got a little heavy handed around the "BANJO" area and made a bit of an impression there in the still wet mud--an easy fix if he wanted to take the time. 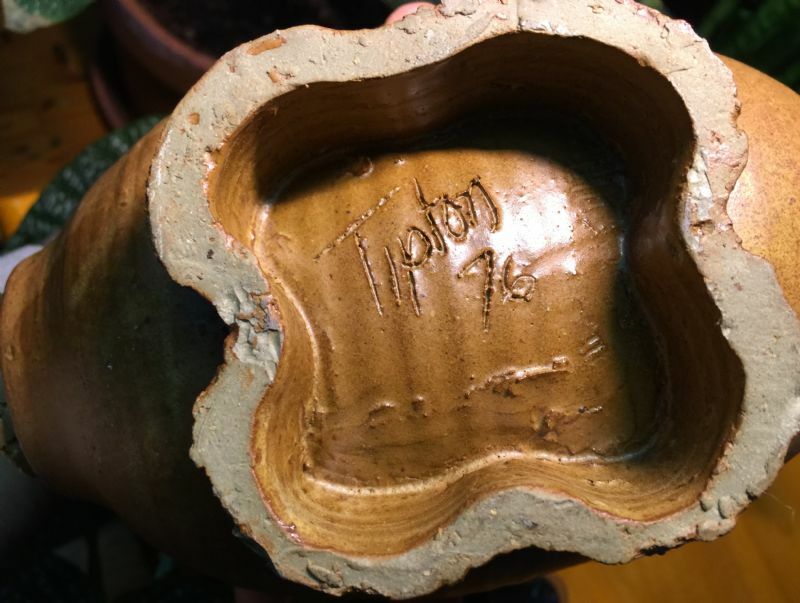 About the signature: My brother took an art class in high school where he spent a lot of time behind the (potter's) wheel, turning out beaucoup pots, vases, and the like. Some of it was ribbed, just like your pig's body, and some smooth. I think I still have a piece or two around here somewhere, and I know he still does. But on every piece's bottom, he would scratch in his name and date with a stylus, so it must be de rigueur for the craft's people who do it. CORTEZ -- When Scott Tipton graduated from Fort Lewis College in the late 1970s, his father gave him a simple choice. He could either earn his keep with a shovel working for the family’s construction company, or he could figure out another way to make ends meet. Tipton chose the second option. Graduating from college in the late seventies, he could have made this in a college art class. It does have a rather amatuerish look about it. Saw this gumball machine online and got excited....thinking to myself "Man, I've got to find one of these". Turns out it's a manufactured "fantasy" piece. Still think it's kind of neat though.